The Round Things - These things are top notch. They have just the right amount of BBQ flavour. There is only two ways to correctly eat the round pieces. 1. you take a cheese stick and wrap the round things around it or 2. you crunch it on your teeth as loudly as you can. The Straight Things - Basically just the round things if they were melted down and stretched out straight. Pretty awesome when you grab one of these bad boys because you know you are basically eating a round thing only elongated. The Cheese Things - Here's where I have an issue. You can't throw sub par food into such a great mix. Usually I'm very pro cheezie but in this case they really cheeped out. Pro tip, grab a bag of Hawkins and add it to your party mix. The Doritos Things- Absolute garbage scum of the earth food. 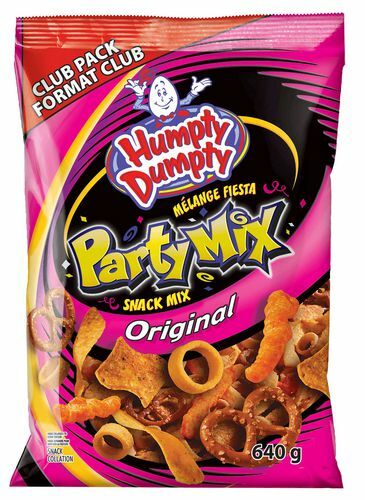 If you aren't left with a big bag of these things by the time you finish your bag of party mix your a psycho path. The Pretzel - Thrown into bag to add a little excitement to the mix. You totally think you are going to dig the pretzel, but again, its of a sub par quality. Whoever the guy was that farmed out the Cheese Sticks was also in charge of pretzel recruitment. We recap; when you rip open a bag, grab a cheese stick and add as many round things as you can. Grabbing a straight thing is fine too. IF you happen to mistake a straight thing for a Doritos thing, drop that crap right back in the bag and pray it never entered your body! What snack food / junk food should I review next?